Episode #361 Part I: Superman Family Comic Book Cover Dated September 1963: Superman's Pal Jimmy Olsen #71! Superman's Pal Jimmy Olsen 71, September 1963! Download Episode 361 Part I! 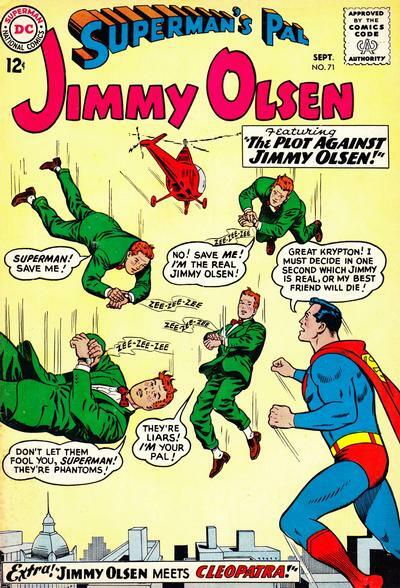 SUPERMAN'S PAL JIMMY OLSEN 71, September 1963, was published around July 3, 1963. It contained 32 pages for the cover price of 12¢. The editor was Mort Weisinger, and the cover was pencilled by Curt Swan, inked by George Klein and lettered by Ira Schnapp. - THE PLOT AGAINST OLSEN (8 pgs. ), writer unknown, pencilled by Curt Swan and inked by George Klein. - JIMMY OLSEN MEETS CLEOPATRA (9 pgs. ), writer unknown, pencilled by Curt Swan and inked by George Klein. - THE NINE LIVES OF JIMMY OLSEN (9 pgs. ), written by Edmond Hamilton and drawn by John Forte. This story was reprinted in SUPERMAN FAMILY 180, November 1976, published on August 19, 1976. That issue contained 48 pages for the cover price of 50¢. The episode begins with a comment made on the previous issue covered, and the monthly MY PULL LIST segment. This time I review the comic books cover dated February 2017, which I received in my monthly shipment from Discount Comic Book Service. Next Episode: SUPERMAN FAMILY COMIC BOOK COVER DATED SEPTEMBER 1963 PART II: WORLD'S FINEST COMICS 136! Then we will feature: SUPERMAN FAMILY COMIC BOOKS COVER DATED OCTOBER 1963: PART I: SUPERMAN'S GIRL FRIEND LOIS LANE 44 & PART II: SUPERMAN'S PAL JIMMY OLSEN 72! Episode #360: Superman 2016: Year In Review! NOTE: For the next two months, the SUPERMAN FAN PODCAST will be on a bi-weekly schedule. It's a brand new year, which means it's time for our annual YEAR IN REVIEW episode for the SUPERMAN titles I read in 2016. This is not a review of the entire line of SUPERMAN titles published by DC Comics last year, only the ones I followed. The issues covered in this episode were all published during the calendar year of 2016, carrying the cover dates of March 2016 through February 2017. I did not go by cover date. Time stamps are listed in parentheses for each segment. - (7:34) New 52 Superman: ACTION COMICS 48 - 52 and SUPERMAN 48 - 52, March - July 2016 cover dates. - (20:37) SUPERMAN: LOIS & CLARK issues 4 - 8, March - July 2016 cover dates. - (30:41) SUPERMAN: COMING OF THE SUPERMEN, a six issue mini-series, cover date May - September 2016. NOTE: During the episode I mistakenly referred to this mini-series as SUPERMAN: RISE OF THE SUPERMEN. - (38:32) DC UNIVERSE: REBIRTH (one shot), cover date July 2016. - (44:50) SUPERMAN REBIRTH 1 (one shot), cover date August 2016 and ACTION COMICS, issues 957 - 970, cover dates August 2016 - February 2017. NOTE: with the REBIRTH issues, ACTION COMICS returned to its original numbering. - (55:27) SUPERMAN 1 - 13 cover dates August 2016 - February 2017. NOTE: with the REBIRTH issues, SUPERMAN began with a new number one issue. - (1:09:13) SUPERWOMAN 1 - 5, cover dates October 2016 - February 2017. - (1:15:05) I reveal my favorite issues and stories from 2016. The next episode of the podcast will be released the week of Wednesday, February 15, 2017 featuring: SUPERMAN FAMILY COMIC BOOKS COVER DATED SEPTEMBER 1963: PART I: SUPERMAN'S PAL JIMMY OLSEN 71 & PART II: WORLD'S FINEST COMICS 136!